Fine food in the Capital city. An inevitable delay back to Auckland from Wellington allows me to jot down a few food highlights of the weekend, dominated by the inaugural meeting for the Ancestral Health Society of New Zealand (AHSNZ) yesterday. It was so good to finally meet in person people I had only had twitter or email conversations with, along with catching up with others I see infrequently in Auckland. While I won’t go into the details of the meeting itself, the day was spent getting to know each other and share some amazing food, coffee and wine in amongst establishing the roles of members of the society and our overall purpose. As it always is when you connect with like minded people, any apprehension felt at the start of the day quickly vanished as we started with introductions and a brief background of how it is we came to be sitting around a table as foundation members of the AHSNZ. Among us were general practitioners, nutritionists and dietitians, a tv producer, health professionals, osteopath, public servants, all brought together with a shared passion and purpose. People had travelled from both all around New Zealand and Australia to be a part of AHSNZ and it’s exciting to be involved from the beginning. Membership for AHSNZ will open up shortly, so if being able to understand health and wellbeing through an evolutionary lens is a concept that resonates with you and is something you are interested in learning more about, head over to the AHSNZ website. Unsurprisingly, the food organised for the day aligned with our overarching principles of whole food and quality ingredients. The lunch was put on by Primal Kitchen, and I recommend all Wellingtonian’s who have yet to check out this take-out whole food enterprise to go over to their facebook page and have a peruse of the menu (see below). We are lucky in Auckland to have a number of avenue’s now (Wilder and Hunt, Jess’ Underground Kitchen, My Food Bag) and it’s great that places like this are bringing to Wellington options that you can be assured are free of added sugar, industrial seed oils and made with quality ingredients. After business was taken care of in the afternoon, including a presentation by Greg Brown showing some pretty phenomenal health changes that have occurred for patients of his undertaking the Whole30 (for more information, click here), we headed off to Scopa for a pre-dinner wine and got talking about everyday life. A particular highlight was learning that Peter Tainui, an Auckland TV producer who has been an advocate for ancestral health for many years, is about to launch bone broth product with a couple of friends. Bone broth is incredibly important for gut health, immune system, the growth of good bacteria and the delivery of essential micronutrients often missed out in the modern diet. Given that almost every client I talk to I recommend they make their own bone broth, yet people do not have the time or inclination to do so, I’m excited that soon I’ll have a place to direct them to in order to buy one. Dinner at Logan Brown was stunning – as to be expected. You can see below the three course menu that was organised. Beautifully presented, delicate yet robust ingredient combinations, we left feeling satisfied. This amazing food was equally backed up by a couple of meals at my good friend Mandy’s house. Mandy has type 1 diabetes and has recently adopted a LCHF diet approach and has found that, more than any other eating style, this has helped stabilise her blood sugars. If you’re ever stuck for a super-quick dinner meal that is both satisfying and impressive, try wrapping chicken breast in bacon (with a bit of grated cheese or pesto) and baking that in the oven for 30-35 minutes. Served with spinach that has cream cheese and grated cheese added, it doesn’t take a lot of food to make you feel completely satisfied. 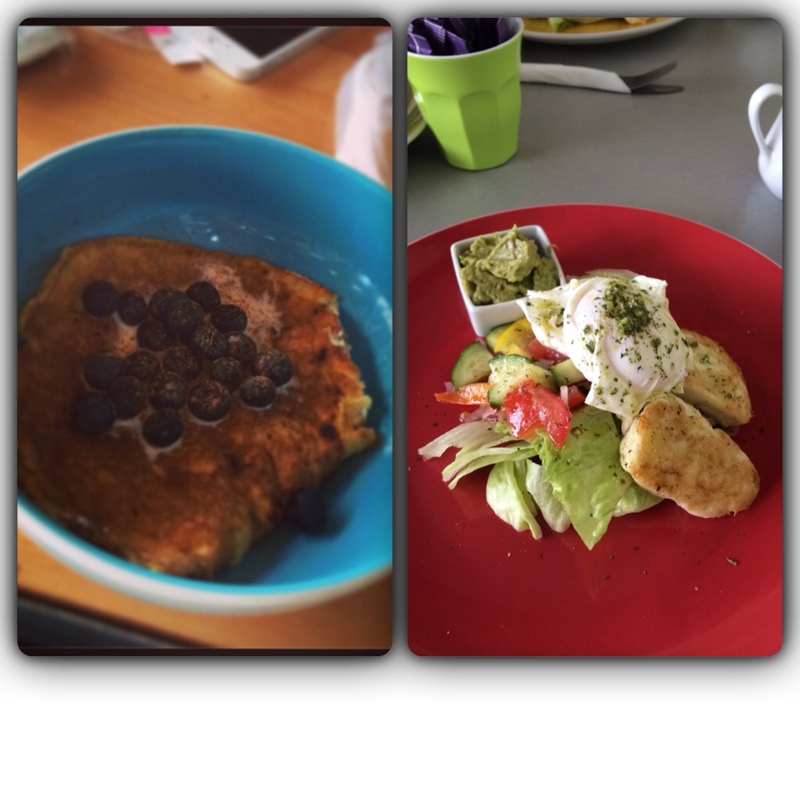 On Sunday morning we enjoyed cream cheese pancakes with some blueberries and a drizzle of cream before heading out to take part in the Colour Run in Upper Hutt. Again, super easy. Literally 2 eggs, 2Tbsp of cream cheese whizzed together with some cinnamon and pan-fried in a bit of butter. A drop or two of vanilla extract would have finished it off nicely. Lunch on the way to the airport was enjoyed at the Centennial, an art-deco style café where we had grilled haloumi with poached eggs, avocado and served on salad. Pancakes on the left, grilled haloumi and poached eggs on the right. Easy. Yes, the post was almost purely about food, but I’m a nutritionist after all. It’s my job to Instagram and talk about yummy easy meals that you can enjoy out and you can create at home with minimal fuss. You’re welcome. What’s the beef with legumes on a paleo diet? Legumes. There is confusion amongst people as to their place in a paleo diet, particularly people who choose to eat a vegetarian diet, this presents an immediate roadblock in their mind: what do I eat if I can’t eat beans? Historically the original ‘paleo’ diet does not recommend legumes as part of the plan – equally this paleo prescription necessitates omitting dairy, starch and cautioning against the consumption of saturated fat. Fast forward to 2014, advocates of the paleo approach to eating are inclined to use evidence to support a diet we believe is optimal for health, rather than rely on historical, emotive and scientifically questionable arguments to underpin eating for health. The main reason we don’t make a song and dance about legumes is they aren’t worth making a song and dance over, really. They aren’t that nutrient dense when they go head to head with animal sources of protein. If you adopt a paleo diet and choose legumes over animal protein then you’re not maximising nutrient density, one of the fundamental principles of a paleo approach to diet. The more nutrient dense foods we eat, the more nutrients we absorb through our diet and the better our body functions. The original argument for avoiding them is largely around the lectins that are compounds contained in the raw bean or pea. These can cause leaky gut and inflammation and a lot of associated gastrointestinal problems. The research that underpins this argument is based on animal studies. That in itself isn’t the problem; many important dietary discoveries begin with a mice or rat model to test a hypothesis. In the mice studies here they were feed large amounts of raw legumes or other foods containing lectins that were raw and sure enough these animals got very sick. But here’s where the disconnect lies: research suggests that a large amount of the lectins that are present in legumes is destroyed by heat in cooking, therefore when you cook the beans the lectins are almost completely destroyed. These are also disabled because they bind to sugars as the carbohydrates are broken down. In the case of the lectins, these bind to the sugars (or carbohydrate) in the beans and they are not going to be absorbed in the blood stream. The argument not to eat them kind of falls flat, given that most people wouldn’t consume raw beans! Peanut lectins are the exception and most people eat peanuts and peanut butter raw so there is a basis for caution there (i.e. don’t consume an entire jar in one go). With all of that in mind, there is limited research that has been conducted in humans to test this theory. But if you are cooking beans in a normal way, and if you are soaking them first – which is always recommended (soaked overnight) then you are able to disable the lectins first and then any residual lectins are combined with the sugars in the beans, which prevents us from absorbing them. Therefore the beans aren’t toxic and they are not going to kill you. So why not eat beans? They are not as nutrient dense compared to other paleo protein sources. In addition, beans and legumes do contain carbohydrate types that are problematic for some people – these are known as FODMAPS. These cause digestive distress and people with fructose intolerance or small intestinal bacterial overgrowth will be best to avoid these. So digestive problems related to legumes might very well be (and mechanistically it makes more sense) that FODMAPS are causing the problem. That said, if you can’t tolerate legumes then it is best to avoid them. Research also indicates that legumes can, over and above other foods, cause a larger insulin response in people who already have some glucose intolerance or impairment. Work currently being analysed by Catherine Crofts, a PhD student in our research centre suggests that people who are metabolically disregulated are able to clear the subsequent carbohydrate from their blood stream, but have an inappropriately high insulin response when they are tracked for up to five hours after consuming legumes. Our understanding of insulin and blood sugar is expanding to recognise that, along with high blood sugar levels, hyperinsuleniamia is as toxic to your body. This can lead to leptin resistance (your body is unable to read signals from leptin that is released when we’ve had enough to eat), inflammation, and other associated issues. This is another group that would be better off not eating legumes. In addition, if you re following a lower carbohydrate, high fat diet, you need to be mindful of the carbohydrate content of legumes – these are rich in carbohydrate – perfect as the carbohydrate component of a meal perhaps, but not if you are monitoring your intake, and not as a regular replacement for animal protein if you’re trying to maximise nutrient intake. For the vegetarians who happily consume these on a daily basis and their main roadblock to investigating a paleo approach to diet, hopefully this highlights that it really is just a wholefood diet. For other healthy individuals that would like more variety, then there is no reason to exclude them if they also are relatively healthy. Many paleo advocates have changed their stance on legumes as more information comes to light, and this makes sense given that the overall premise is to advocate the most nutrient dense diet that you can eat. Legumes can and do have a role – and this might differ from your understanding of the paleo diet. Is it time to change the Youtube clip? I was running through the forest in Rotorua, as part of the Tawawera Ultramarathon relay yesterday morning, and the course turned from the groomed trails of the Redwood forest to an unforgiving rough single track that ran between the Blue Lake and Okareka. I’m a road runner. I love the trails but if it’s not smooth, straight and well formed then I might as well be hiking. For the most part, the event was completely runnable and it was only this part of the track that was not my cup of tea. I only had around 3.5km to run, and my pace immediately slowed. I had only run 15km – less than a quarter of what most people were out there running as part of the event (that had been shortened from 100k to 70km due the weather)– and my race was almost done. I was really noticing the effects of less than ideal preparation (along with a weight session) in my legs. Negotiating the gnarly, rooted track on fatigued legs that are more used to the camber of the road than the rough of the trail could spell all sorts of trouble. The foreboding threat of a rolled ankle or getting a foot caught under a tree root loomed over me. While I tried to remember the key points for remaining upright on these trails, as taught to me by Rebecca, a good friend who’s second home is on the trails, I realised that the prevailing thought going through my head as I was stepping over the tree roots and diving under branches at a pace almost slower than walking was “I’m so useless on this terrain.” At that moment, though, it dawned on me that I was setting myself up to do the very thing I was trying to avoid. I was at once wishing myself to become a confident, fast-footed, light on my feet trail runner, yet my default thought pattern did not reflect this at all. This realisation brought me back to a simple truth: my thoughts determined my actions; my actions determined the outcome. If I was going to be a flight-of-foot trail runner right then and there, I had to change my mindset. I’ve been thinking about this a lot recently. With my clients, more often than not the successful ones are those that have a readiness for change. They come to me to learn the tools required to make changes related to diet, but already they’ve taken the most important step. With almost everybody I can tell within the first fifteen minutes whether or not they have the right mindset to make a change to their diet. Doctor’s referrals aside, it might seem strange that someone would visit a nutritionist voluntarily and not actually want dietary advice. But it does happen. Sometimes it’s because their friends have come along and have recommended they come along too. Sometimes it’s because seeing a nutritionist ‘is the thing to do’ or because they ‘know they should do something’ with their diet. And sometimes they want to want to change their diet, but when push comes to shove they are not willing to make the changes necessary to put the plan into place. With clients like these, their success doesn’t lie with meal choices or the variety of foods as part of their overall plan – these things are a given as part of a consultation. The real success comes from drawing a line in the sand and deciding to change the way they think; without this, the best, most varied, most convenient plan ever created will not be enough to help them meet their dietary goals. Our mindset is almost always the default. Is your glass half empty or half full? Do you see a challenge as an opportunity to succeed or another for you to fail? Do you wake up feeling burdened by all that you’re trying to achieve for the day, or excited by the opportunities that exist? Do you attribute other’s success to their innate characteristics (“it’s in their genes”) that are beyond your control and out of your reach? This is how we view the world. The best piece of advice I have had recently is that I need to change the Youtube clip that is running in my head telling me that I can’t do it. My thoughts determined my actions, and my actions determined the outcomes. Once I realised this then anything is possible. If you’re anything like me, the Youtube clip related to my ability to run on trails has been on replay for 20 years since I tried to keep up with Rebecca and Rachel in the relatively easy trails of Ross Creek; in other, more important areas of my life there is a version of that Youtube clip related to an offhand comment that has stayed with me and informs my thoughts and actions today. It’s only now that I am realising this and ultimately how powerful these instances are at determining how we feel and what we do. A lot of people I talk to about diet, health, weight loss or exercise have their version of the clip. They’ve always believed they are fat because their mother told them so; they don’t recognise their talent at a particular skill they have because someone else was always praised over and above them; they don’t believe they can lose weight because past history shows they’ve never succeeded before (and it’s their fault). Being aware that this is a mindset that can be changed over time is the first and most important step to becoming who you want to be. For those people who are at the cusp of making a change in their life then this will remove the roadblock they might not even realize is there. But if they begin to believe it is possible, then this will pave the way for the next step. It might be a small shuffle, or it might be a giant leap; regardless of the size, it will be in the right direction. For me, in this particular moment on that trail in the last section of the race, I realised I had to quickly adopt a different thought pattern to successfully negotiate the trail and not come at it from a place of fear but from a place of confidence. I started repeating in my head that I was “fit, fast, healthy, strong” and that “this was my terrain.” I noticed an immediate shift in my mindset by repeating these statements over and over – but more importantly I felt lighter on my feet and more confident in my footing. While this hasn’t magically transformed me into a trail running mountain goat, this illustrated to me just how powerful my mindset was at determining my confidence on the trail and my subsequent enjoyment of the overall event. Your thoughts determine your actions. Your actions determine the outcome. Is it time you changed that Youtube clip? Hidden sugar? Not a conspiracy theory. STOP PRESS: that sticky date pudding will send you over your recommended sugar intake faster than you can say “and I’ll have a hot chocolate with that, thanks.” I know. Sugar again? Are your eyes glazing over with yet another post about the dangers of sugar? This is completely irrelevant to you: you don’t eat pudding anyway. With the draft proposed new sugar recommendations released by the World Health Organization (WHO) recommending we slash our added sugar content by half, it could be worth paying more attention. Do you know what the recommended maximum limit of sugar is? Most people don’t and for good reason – there haven’t been the same hard and fast rules that draw a line in the sand about our sugar consumption as there have been for fat. However the proliferation of processed food, combined with escalating health problems are good reasons to relook at the limits recommended. The WHO are suggesting that we cut our sugar intake to 10% or less of our daily energy intake, or for optimal benefits, cut it down to just 5% of our energy intake. That equates to approximately 6 teaspoons or 25g of added sugar per day. That’s sugar added to the manufacturing process of food – either by the manufacturers, the chef’s, or the home cook – and not that which is naturally occurring in food (such as fructose in fruit, or lactose in dairy). It does however include fruit juice concentrate, maple syrup, coconut sugar, rice malt syrup and other sweeteners that have almost a health halo and are often overlooked because they are less refined than their white granulated counterpart. Again, if you’re not someone who adds sugar or any type of sweetener to food, then you may think this is irrelevant to you – particularly also if you read articles like this which highlight products that, in themselves, would send your sugar intake sky high. The real problem with sugar, however, is that it is in places you might not expect it to be. You may have heard of these ‘hidden’ sugars – 56 other names for what is essentially the same thing. 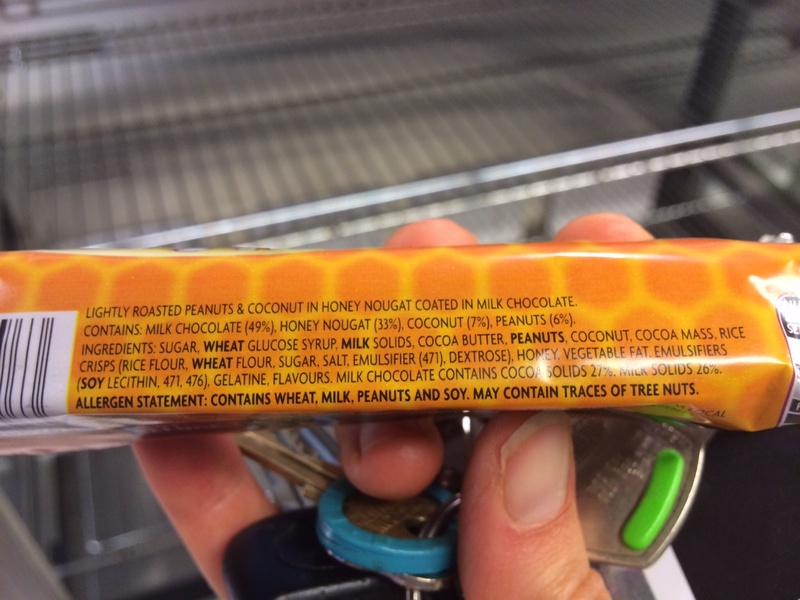 Ingredients are listed in order of appearance in the product: the higher up the list, the more it contains. When you combine the sugar, glucose syrup, molasses and honey, over half of the energy in a product could come from sugar. A good example of this is the Europe muesli bar – this is like the original health bar. Even I was surprised that sugar was the first ingredient. 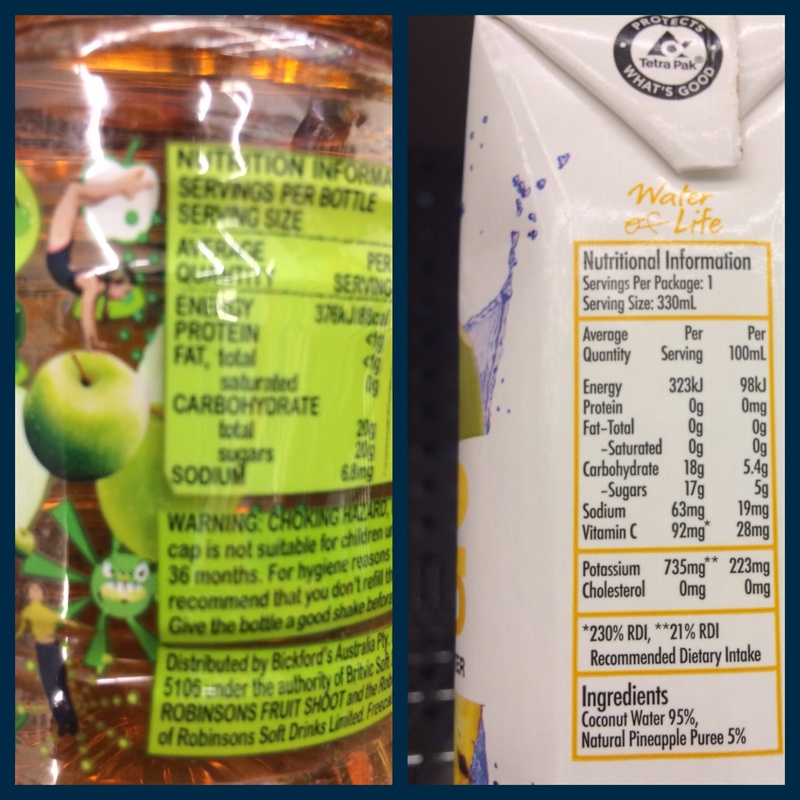 Further along the list you’ll notice glucose syrup, sugar (again), dextrose and honey. This explains why, from the 40g bar, 19.4g of it is sugar. Almost half of this 40g bar is sugar. Below are some common sugar traps that I see time and time again with clients. Cereal: This is a common one, and not just for those eating Coco-pops. 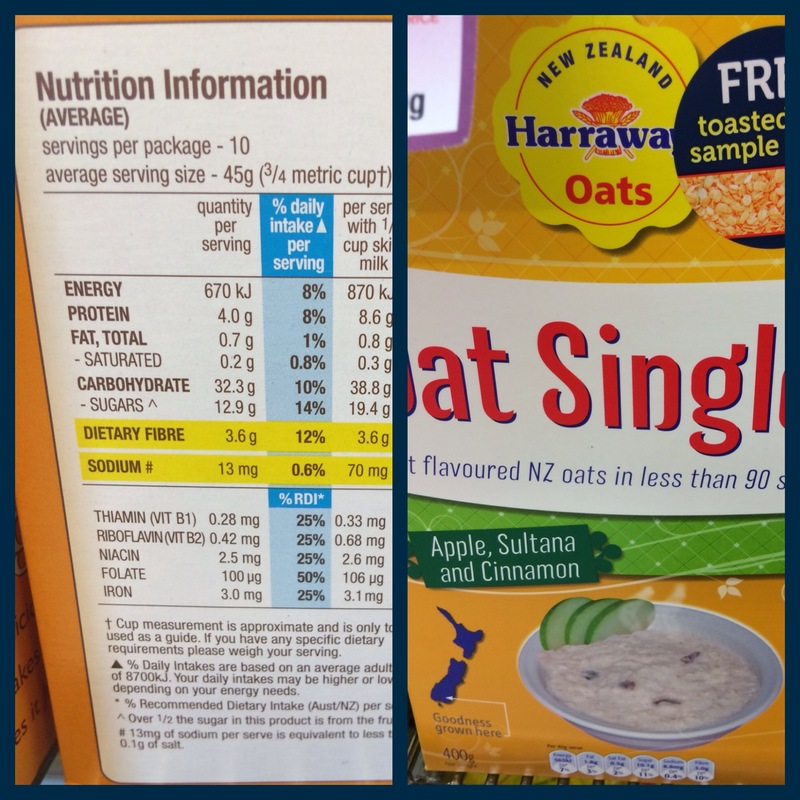 A cereal like Just Right, for example, has close to 13g per serve of sugar. Though half of it comes from dried fruit, this often includes juice concentrate in the preserving process. A bigger problem, though, is the amount actually consumed. How often have you wondered how on earth you’d get 10 serving sizes out of the box that lasted you just four breakfasts? Porridge is another one – the advent of the single sachet has brought with it many varieties to help alleviate the boredom of oats for breakfast. However, not only are the oats more refined than wholegrain oats, there can be an additional two teaspoons of sugar added. If you can’t bear the thought of a morning without oats, soak wholegrain oats overnight to remove some of the phytic acid (which inhibits absorption of nutrients). Better yet, avoid the cereal aisle altogether and have Eggs (aka a superfood worthy of capitalisation). Condiments: I used to be a condiment queen – and a lot of people are. However, when one 15 ml serve of tomato sauce adds a teaspoon of additional sugar, and sweet chilli sauce adds close to three , the amount of added sugar can quickly add up – particularly if it’s your favourite sauce on kebabs, or you consume it in most meals. Unsurprisingly, chutneys and pickles can be the same. Often the brands that are a little more expensive tend to be made with better quality ingredients, and therefore don’t need to rely on sugar for flavour. Where possible, hunt these out. Or make them yourself. I find cherry tomatoes at the end of a season, roasted with olive oil, garlic, a bit of chilli and red onion delicious to have as a condiment. No sugar added and very cheap to make. Low fat fruit yoghurt can provide additional sugar, and, even when attributing that present anyway (around 4-5g of lactose per 100g) it’s not uncommon for a 150g pottle to have 15g of sugar in total (or 10g that would count towards your added sugar intake. Another, bigger trap are the yoghurts that are labelled Greek or Natural, yet contain sugar in the ingredient list. Fresh and Fruity, Puhoi Valley, DeWinkle Greek yoghurt are just three that spring to mind. Piako is another local brand whose ‘natural’ yoghurt is almost as high in sugar as their flavoured varieties. However, they have recently brought out a much welcome ‘naked’ variety of Greek yoghurt that contains no additional sugar. I was chatting to the owner of Piako this morning during the Round the Bays fun run actually, and he said it took a long time to get the formulation right. I’m glad they persevered, as it tastes awesome. 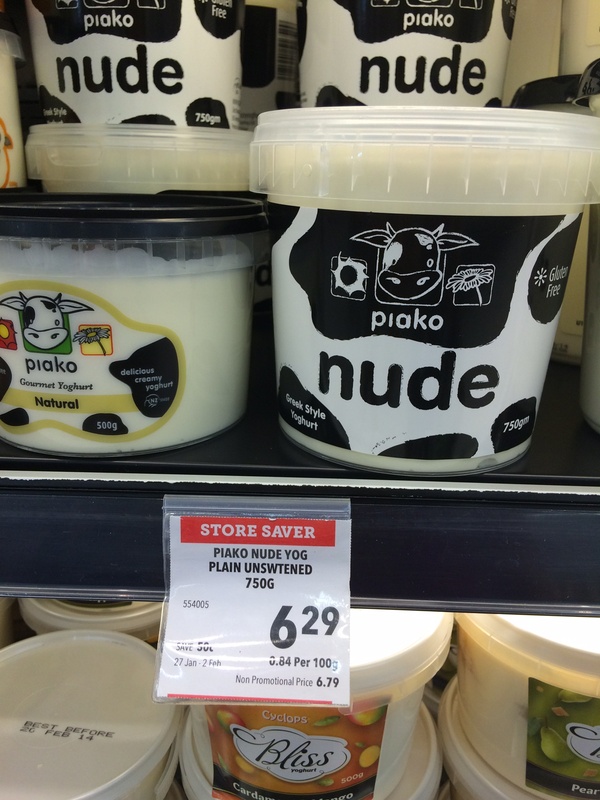 Always look at the ingredients list before purchasing a natural yoghurt. Baked beans: a 440g can of baked beans contains 49.6g of carbohydrate, with nearly half of that (20.2g) coming from sugar. If you must eat these – look for a low sugar variety, usually placed a few rows down below the standard. A better alternative is to spend time whipping up your own, with chilli, garlic, tomato paste, tomatoes and perhaps a bit of balsamic vinegar. If you’re using baked beans as a protein source – there are better options. Try tinned fish instead. We all know that fruit juice contains sugar – it is equivalent to soft drink in many instances. The sipper bottles invented for children are no different. Coconut water is often revered for its health benefits; while it does contain more electrolytes, it can also contain sugar that you just don’t need – 17g in this 330ml box. Even the plain ones contain sugar which not many people are aware of. I don’t mean to bore you but the best choice for fluid, for most people, is water. Small but packing a hefty sugar punch. So pay attention and start looking at the ingredient lists. Better yet, go whole food – you can’t go wrong. Some tasty snacks to help you fat adapt. Eating less and moving more – this idea sounds reasonable and on some levels there isn’t much wrong with it. Let’s face it, there are lots of people who could do well if they followed this basic advice. Many people do eat too much overall and do not do enough physical activity. This isn’t necessarily said with a view to help people lose weight. There are many more reasons why we do need to be more active – emotional, hormonal, metabolic, physical – which will obviously contribute to the weight loss journey but in themselves are worthwhile health goals. It is reasonably well established that, just as you can be a fitter, bigger person and be at low risk of chronic disease, you can appear lean yet this belies a potential health catastrophe brewing underneath the surface. Merely being active can increase the number of mitochondria to enable us to tap into body fat stores more too. Likewise, there are people out there who consume far too many calories, regardless of what foods and beverages they come from. So on the surface it makes sense. However for the athlete reading this, it’s unlikely to be the explanation. It’s likely that the training you do will mean you’re burning through calories like they’re going out of fashion. So if eating less and moving more ISN’T an option, what then? Food matters. A whole-food diet acknowledges that the calorie has a context. If you’ve spent a large part of your life eating a relatively high carbohydrate diet, then the bulk of carbohydrate you ingest will be burnt off as fuel first and foremost, then the rest will be stored in the liver and muscles predominantly. There is little opportunity for your body to burn any fat as a fuel source given there is a relatively easy supply of energy from carbohydrate available, due to the effects of carbohydrate on insulin, our nutrient storing hormone. This is not the case with calories coming from fat and protein. General population aside, it takes just takes a cursory glance at the middle to latter half of the field of an endurance event to see the effects of a diet that has been high in carbohydrate. A large proportion of these athletes do not sport their optimal body composition. And sure, while a few of them may not have done the training they would have liked – “real life” and endurance training do not always see eye-to-eye – this does not explain why many people are carrying excess body fat. Now I don’t mean that everyone who trains and competes should have the physique of a top-end athlete. At all. There is no one ‘perfect’ physique; but there is an optimal physique for everyone, and for the athlete this equates to being as fit and healthy as you can be in life to enable you to tick off the training required to meet your performance goals. For everyone, this requires burning fat as fuel. You may be already achieving this, especially if you’re used to training in a fasted state, or you’re not in the habit of taking on board fuel during training sessions that don’t require it. However if you aren’t supporting these tactics with a good diet outside of training, then you could be undoing all of your hard work. So this is really just a reminder to take the time to think about your diet outside of this. And with that admittedly long preamble, a perfect excuse to throw down some ideas (some new, some not) to help increase the fat and protein in your day and rely less on carbohydrates. Often times it’s a lack of inspiration that stops us from breaking out of habits that don’t serve our goals. As snacks are an area where people often need a little help with, I’ve got some smoothie guidelines, some sweet snacks, some savoury ones and a mixture of the two. They rely on whole food options that require varying degree of preparedness. While for some ideas there is a general portion amount, try and use your hunger to guide you on how much to consume. If your favourite isn’t listed (which is likely, as this is a fairly small list!) please share it in the comments section below. Smoothie: play around with your favourite ingredients to make a smoothie that suits your needs. Add water to thin to desired consistency. If you choose coconut water, be mindful that there is additional sugar here, even in pure coconut. Whizz a grated zucchini with ½ c raw cashews, a preserved lemon quarter, a crushed garlic clove, 1T olive oil, a handful of parsley and season. Hard cheese sliced with baby carrots/celery sticks and cherry tomatoes. Grilled haloumi, red pepper chunks and sliced raw zucchini on a skewers. Avocado sprinkled with cajun seasoning and grated cheese, grilled. Cottage cheese with pesto and toasted pumpkin seeds mixed and stuffed in half a capsicum. Walnuts, macadamias, coconut flakes and almonds mixed. Wrap grilled bacon around apple slices. Hardboiled eggs, shelled and transported in a gladwrap bag that has been seasoned with salt and pepper. Large handful of olives (again, gladwrap bag). Chunks of cheese and olives. Sliced ham wrapped around cherry tomatoes. Sliced cucumber, spread with pesto with thinly sliced cheese (try a gouda, havarti or emmental cheese for a change of scene). Pan-fry sardines that have been packed in olive oil and rolled in almond meal and cajun seasoning. 1-2T coconut oil/coconut butter with 1/2 t organic cocoa or cacao powder mixed through. Sliced hard cheese on slices of apple. Cottage cheese or Greek yoghurt with grated apple, sprinkle cinnamon and toasted pumpkin seeds. Whizz together 2 eggs, tablespoon nut butter, ½ banana and ¼ t baking soda. Microwave 3-4 minutes. Frozen banana chunks and 2t nut butter, whizzed. Tablespoon nut butter mixed with 1t chia seeds and 3T cottage cheese. 3T frozen berries, thawed with 1t coconut oil and an egg mixed in, Microwave 60-90 seconds. ½ c berries with 3-4T coconut cream or milk poured over, with a squeeze of lemon juice. ½ c fresh walnuts, drizzled with melted coconut oil and sprinkled with cinnamon, toasted at a medium heat until crisp. *And of course there are those who really do just eat too much and train too little. But that’s a subject for another post.